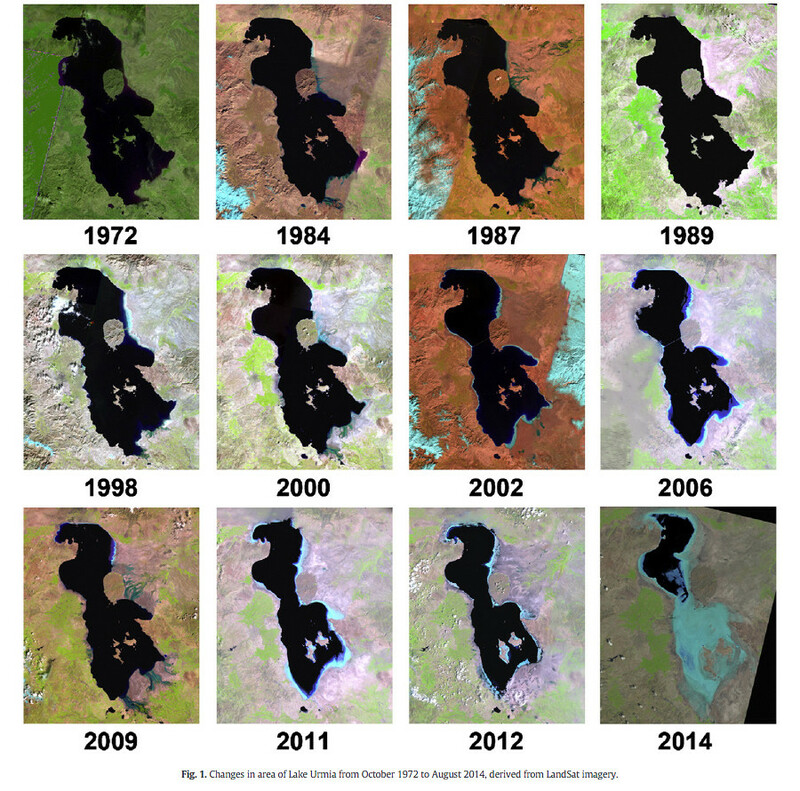 A drought of epic proportions at Lake Urmia has brought the Iranian UNESCO site to the brink of disappearing off the face of the Earth, and is turning its once blue waters blood-red. While once Urmia spanned an area five times larger than Hong Kong, its volume has decreased dramatically since 1972. A study by hydrology experts at the University of California in 2014 painted the picture of a dying natural resource, highlighting how desiccation, or drying, had reduced the 5,000 sq km (1,930 sq mile) lake by almost 90 percent. Its catastrophic demise has been compared to the loss of the Aral Sea, where poor irrigation and farming practices contributed to it drying up almost completely. 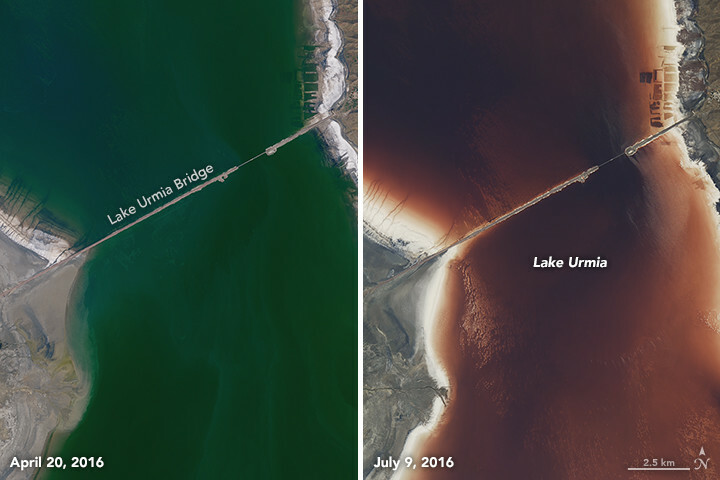 Massive salt content in the Urmia’s dwindling waters has now given it a deathly tinge, turning it a dramatic blood-red color. Scientists working with NASA’s Earth Observatory have explained that as water levels drop during the hot summer months, microscopic algae and bacteria become more apparent, causing the unusual hue. The color phenomenon has occurred a number of times before but is becoming increasingly common. Satellite monitoring of the site has revealed that the latest reddening occurred between April and July of this year. Mohammad Tourian, of the University of Stuttgart, has been observing Urmia’s gradual disappearance. He indicated that alarming depletion of the lake at 1.03 cubic kilometers per year has allowed algae known as Dunaliella salina to take hold. 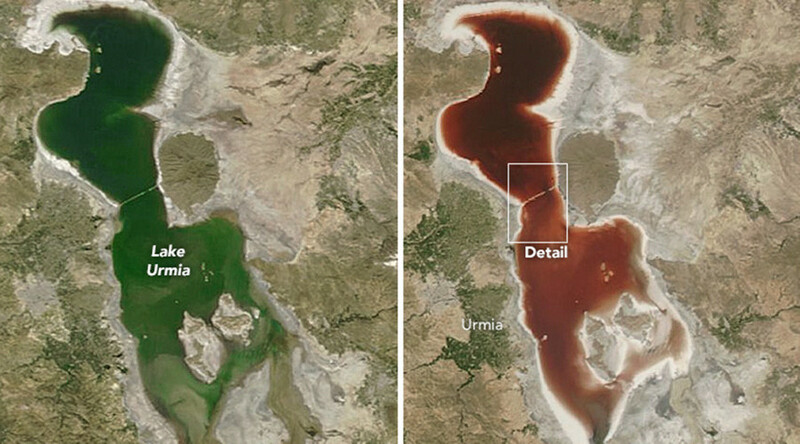 “Previous research suggests that Dunaliella salina [algae] is responsible for reddening of Lake Urmia,” Tourian said. In 2014, Iranian President Hassan Rouhani announced funding of $5 billion to save the former popular tourist location. However, there are fears that the damage done is beyond repair. “The results from satellite imagery revealed a loss of water extent at an average rate of 220 sq km per year, which indicates that the lake has lost about 70 percent of its surface area over the last 14 years,” said Tourian.